← Why Take Chemistry, Anyway? One of the most important ways that a chemist can show data to other people is by graphing it. Not only do graphs give a good view of what the trends in the data are, but they also make a scientific paper look nicer. After all, who wouldn’t rather read a picture book than one without illustrations? Unfortunately, many of you (yes, you) don’t know how to draw a good graph. 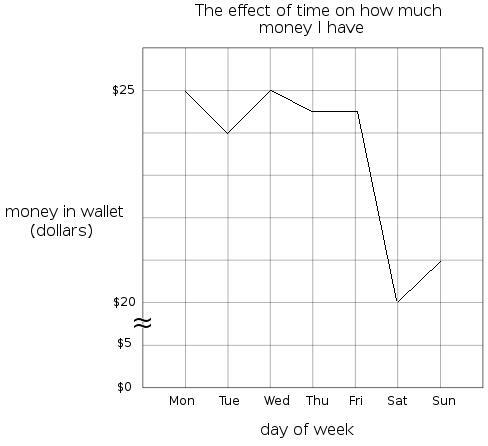 Or even know what a good graph is supposed to look like. I blame newspapers for this, because newspapers exist to make news look cool, rather than to actually inform you about anything. If you think I’m mistaken, look at the main section of any newspaper and see for yourself. Anyhow, I’m here to tell you about the seven steps that will allow you to make wonderful graphs. Let’s begin, shall we? The independent variable in an experiment is the variable that you manipulate, and the dependent variable is the outcome of that manipulation. If you want to find out how heating a mixture will change the rate of reaction, the independent variable is the “heating the mixture” and the dependent variable is the “rate of reaction.” This is because the thing you’re doing is heating the mixture, and the result you’re studying is the rate of reaction. If, on the other hand, you were to write a title that read “What happened when I heated the mixture”, that would be a lousy title because it wouldn’t give much information about what happened. The x-axis of your graph (the one on the bottom) should always represent your independent variable. The y-axis on your graph (the one that goes up and down) should represent your dependent variable. If you’re not sure which variable is which, either look at what you wrote in step 1, or ask yourself “What did I actually do in this experiment?” (x-axis) and “What did I measure in this experiment?” (y-axis). 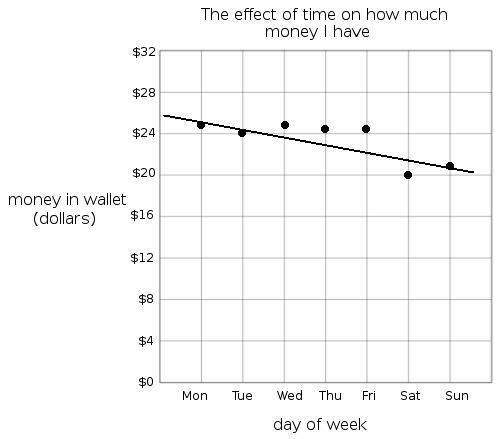 For the record, time is always going to be your independent variable and will always reside on the x-axis. This is because any event will take place as time passes, rather than time passing (or going backwards!) as events take place. 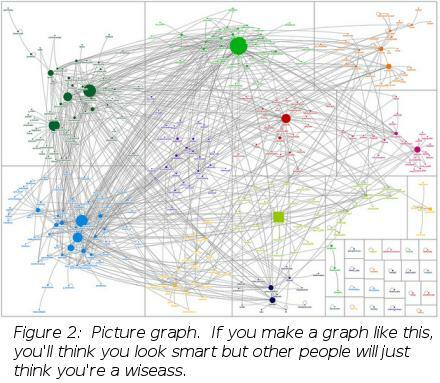 You’ve probably seen many types of graph in your life. Bar graphs are common in economics books, pie charts are common in USA Today (for some reason), and picture graphs are just stupid. And, of course, you’ve seen line graphs before. In science, we always use line graphs. This is because graphs are intended to help us to figure out the trends that develop between the independent and dependent variables. For example, if we have a good line graph that covers how temperature has changed from time = 0 seconds to time = 240 seconds, we can use it to figure out what the temperature should be at any time between these points, even if we didn’t take data there. Bar graphs are used to show the values of different things at the same time. For example, if you wanted to show what the economy looked like in 2014, you could make a different bar in the graph to show how much money each part of the economy was responsible for. Perhaps one bar for military, one for social security, and so forth. Picture graphs are used by morons. Don’t use them. Step 5: Never connect the dots! Remember, the idea of a graph is to figure out how two variables are related to one another and to make it possible to predict what will happen at any given point. If you connect the dots, this won’t be possible. I know this looks like a good graph. And it is very nice. 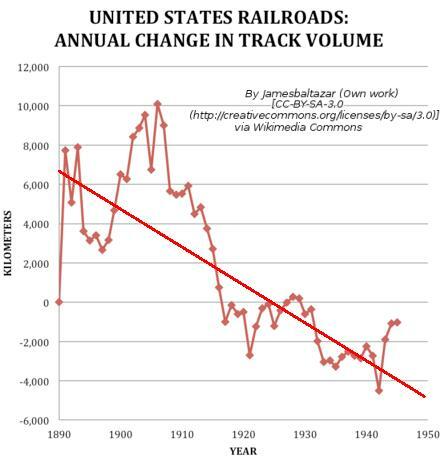 However, let me ask you something: What will the change in track volume be in 1950? Go ahead… use the graph to figure it out. Here’s the problem: You can’t. By showing the data in this way, it’s impossible to see exactly what will happen over time. Though we can see that the graph trends downwards, it’s impossible to make any good guesses about what will happen. And, after all, that’s the point of a graph. 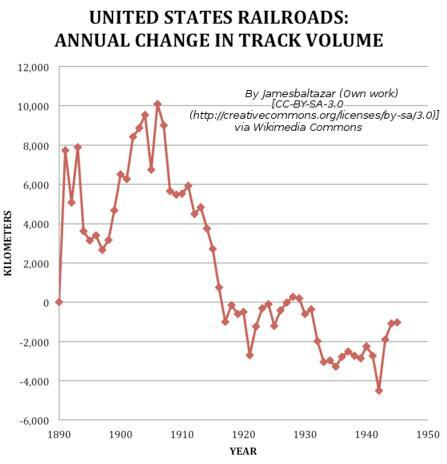 From this graph, we can see that in 1950, the expected change in track volume will be about -4800 km. Is this exactly what will actually happen? Probably not. However, does it give us a good idea about what’s generally happening? You bet. It may not be -4800 km, but that seems like a pretty good guess based on the data. The beauty of this graph is that it doesn’t make any sense. I don’t even have to say what the graph is supposed to show, because you know that it’ll be impossible to figure out what’s going on given the tiny scale of the data. Draw the data in a larger form, and you’ll actually be able to figure out what’s happening! Holy crap! I was doing OK and then disaster hit on Saturday! Suddenly, I look a lot less poor. Which is what reflects reality. Those little squiggles in the first graph may tell people that the points between $5 and $20 have no value, but they do. Though there’s no exciting stuff happening there, the gap that the squigglies take out changes the apparent scale of the graph, which makes it harder to understand. Since we’re trying for comprehensibility, that’s bad. Graphing Practice Worksheet: Has this lesson taught you how to make a good graph? Let’s find out! Questions I’ve been asked about graphing: If you have remaining questions, maybe somebody else has asked them already! Ridiculous video about graphing: What’s a Graph? Though this video was originally made for very young children to learn what a graph is, I think you’ll find that it’s equally worthless for people of all ages.